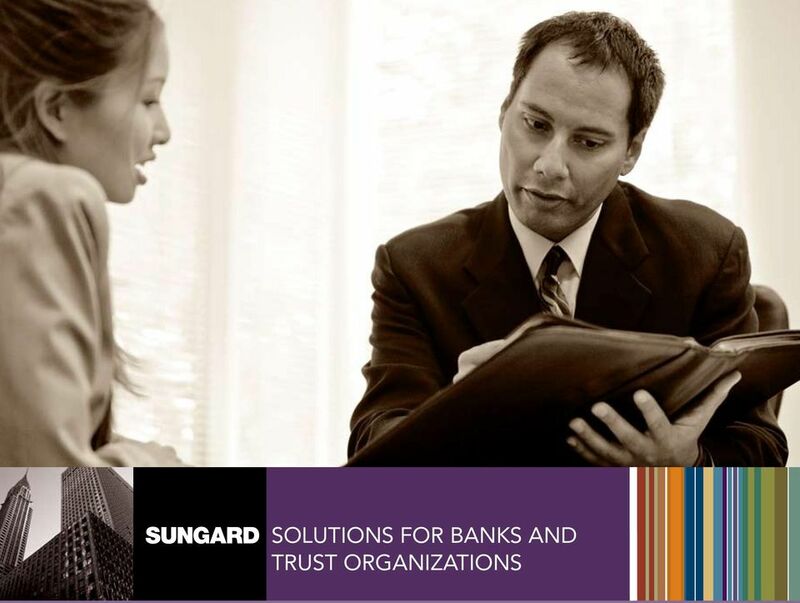 Download "SOLUTIONS FOR BANKS AND TRUST ORGANIZATIONS"
2 SunGard s suite of wealth management solutions is designed to meet evolving business needs at all levels of your organization. From financial planning and trading to accounting operations and custody services, SunGard has a solution for you. These adaptable, extensible products and services can be selected, packaged and deployed based on your organization s individual requirements. In addition, they integrate easily with each other and with third-party offerings to help create a seamless, total-solution architecture. 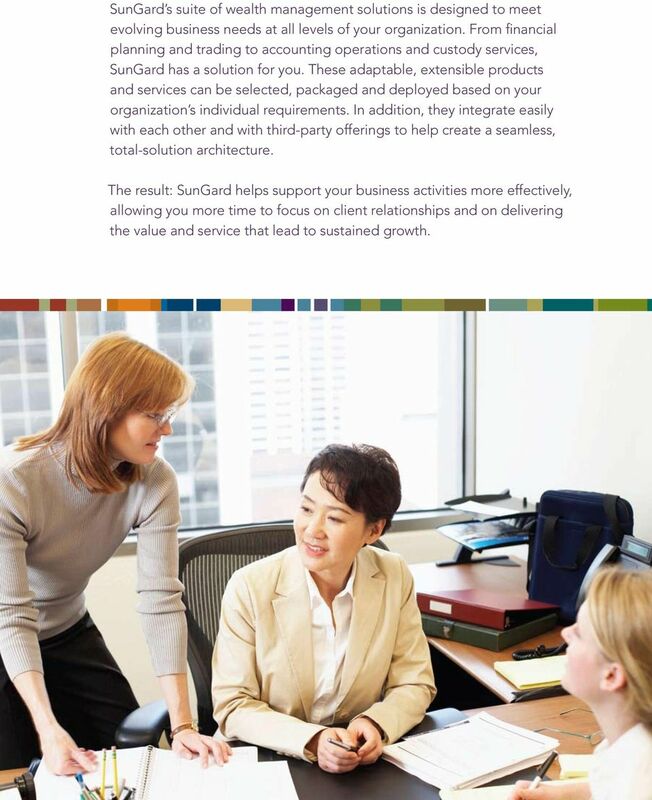 The result: SunGard helps support your business activities more effectively, allowing you more time to focus on client relationships and on delivering the value and service that lead to sustained growth. 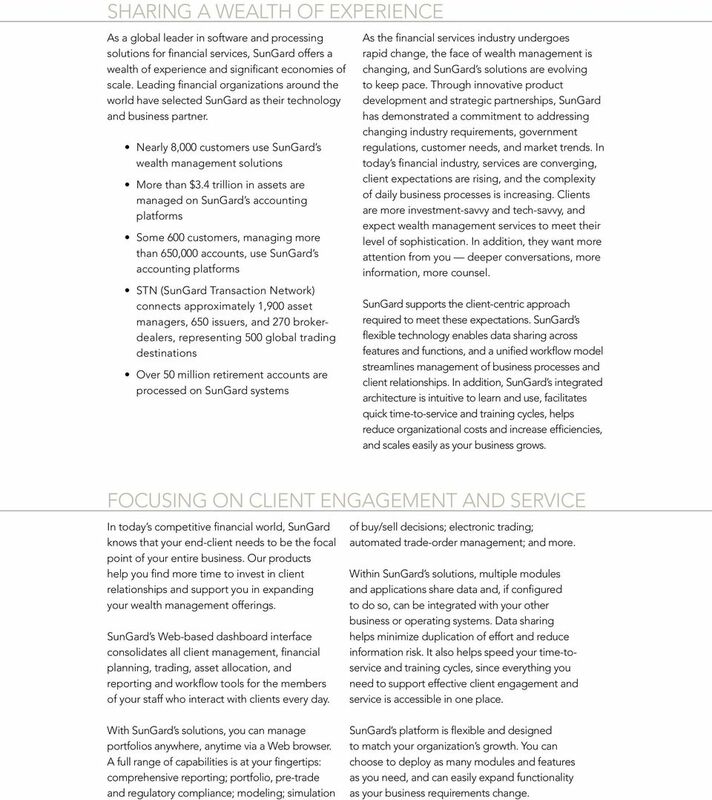 3 Sharing a Wealth of Experience As a global leader in software and processing solutions for financial services, SunGard offers a wealth of experience and significant economies of scale. Leading financial organizations around the world have selected SunGard as their technology and business partner. 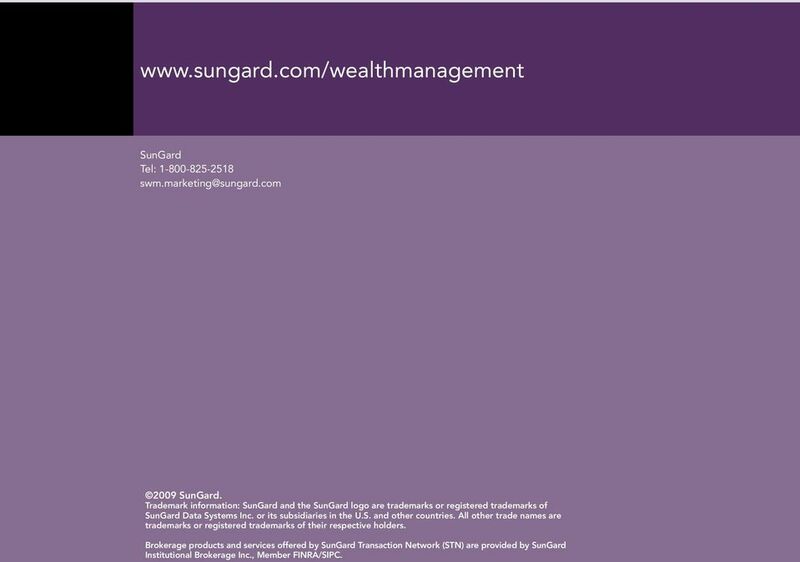 Nearly 8,000 customers use SunGard s wealth management solutions More than $3.4 trillion in assets are managed on SunGard s accounting platforms Some 600 customers, managing more than 650,000 accounts, use SunGard s accounting platforms STN (SunGard Transaction Network) connects approximately 1,900 asset managers, 650 issuers, and 270 brokerdealers, representing 500 global trading destinations Over 50 million retirement accounts are processed on SunGard systems As the financial services industry undergoes rapid change, the face of wealth management is changing, and SunGard s solutions are evolving to keep pace. Through innovative product development and strategic partnerships, SunGard has demonstrated a commitment to addressing changing industry requirements, government regulations, customer needs, and market trends. In today s financial industry, services are converging, client expectations are rising, and the complexity of daily business processes is increasing. Clients are more investment-savvy and tech-savvy, and expect wealth management services to meet their level of sophistication. In addition, they want more attention from you deeper conversations, more information, more counsel. SunGard supports the client-centric approach required to meet these expectations. SunGard s flexible technology enables data sharing across features and functions, and a unified workflow model streamlines management of business processes and client relationships. In addition, SunGard s integrated architecture is intuitive to learn and use, facilitates quick time-to-service and training cycles, helps reduce organizational costs and increase efficiencies, and scales easily as your business grows. Focusing on Client Engagement and Service In today s competitive financial world, SunGard knows that your end-client needs to be the focal point of your entire business. Our products help you find more time to invest in client relationships and support you in expanding your wealth management offerings. SunGard s Web-based dashboard interface consolidates all client management, financial planning, trading, asset allocation, and reporting and workflow tools for the members of your staff who interact with clients every day. of buy/sell decisions; electronic trading; automated trade-order management; and more. Within SunGard s solutions, multiple modules and applications share data and, if configured to do so, can be integrated with your other business or operating systems. Data sharing helps minimize duplication of effort and reduce information risk. It also helps speed your time-toservice and training cycles, since everything you need to support effective client engagement and service is accessible in one place. With SunGard s solutions, you can manage portfolios anywhere, anytime via a Web browser. A full range of capabilities is at your fingertips: comprehensive reporting; portfolio, pre-trade and regulatory compliance; modeling; simulation SunGard s platform is flexible and designed to match your organization s growth. You can choose to deploy as many modules and features as you need, and can easily expand functionality as your business requirements change. 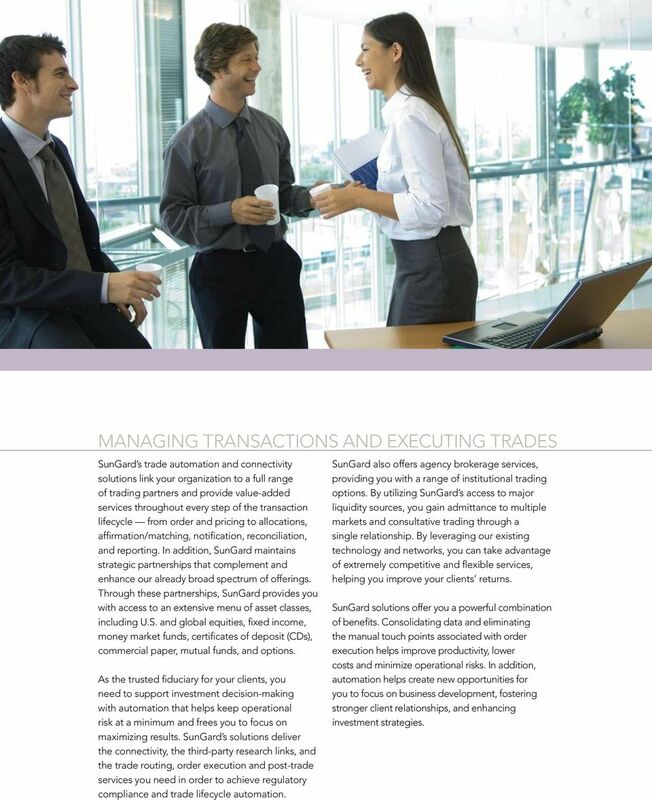 4 Managing Transactions and Executing Trades SunGard s trade automation and connectivity solutions link your organization to a full range of trading partners and provide value-added services throughout every step of the transaction lifecycle from order and pricing to allocations, affirmation/matching, notification, reconciliation, and reporting. In addition, SunGard maintains strategic partnerships that complement and enhance our already broad spectrum of offerings. Through these partnerships, SunGard provides you with access to an extensive menu of asset classes, including U.S. and global equities, fixed income, money market funds, certificates of deposit (CDs), commercial paper, mutual funds, and options. As the trusted fiduciary for your clients, you need to support investment decision-making with automation that helps keep operational risk at a minimum and frees you to focus on maximizing results. SunGard s solutions deliver the connectivity, the third-party research links, and the trade routing, order execution and post-trade services you need in order to achieve regulatory compliance and trade lifecycle automation. SunGard also offers agency brokerage services, providing you with a range of institutional trading options. By utilizing SunGard s access to major liquidity sources, you gain admittance to multiple markets and consultative trading through a single relationship. By leveraging our existing technology and networks, you can take advantage of extremely competitive and flexible services, helping you improve your clients returns. SunGard solutions offer you a powerful combination of benefits. Consolidating data and eliminating the manual touch points associated with order execution helps improve productivity, lower costs and minimize operational risks. In addition, automation helps create new opportunities for you to focus on business development, fostering stronger client relationships, and enhancing investment strategies. 5 Supporting Accounting and Custody With industry-proven solutions, SunGard can deliver a combination of capabilities to meet your organization s investment, operational and administrative needs. SunGard s solutions support a broad range of activities, from securities processing and asset accounting to trust accounting, multi-currency accounting, reconciliation of depositary and sub-custodian positions, portfolio and cash management, fee and disbursement processing, and custody. These solutions integrate easily with third-party product offerings, as well as with other SunGard solutions. With SunGard solutions, you have the core technology and connections to help you achieve your goals. The open design, rich functionality and user-friendly flexibility place you in control of your own data, and provide you with tools to perform at optimum levels. The automated interaction between SunGard s accounting, trust and custody systems helps keep you informed about all aspects of your clients portfolios. Inquiries, research and monitoring are straightforward, and more information is accessible to you than ever before. In addition, SunGard s custody services can help your custodial group extend its resources through a custody account administrator assigned to your organization. This SunGard professional acts as an extension of your own custody department handling research, questions, follow-ups and more bringing to bear an extensive background in securities processing, trust and trust systems. SunGard also maintains strategic relationships with industry-recognized custody providers, giving you multiple options for safekeeping and clearing. This allows assigned administrators and your custodial group to provide each client with a tailored offering. Everyone benefits: The client receives personal, broad-based and expert service, and your organization gains the internal operating efficiencies, productivity and peace of mind that SunGard s custody expertise can bring to the business. 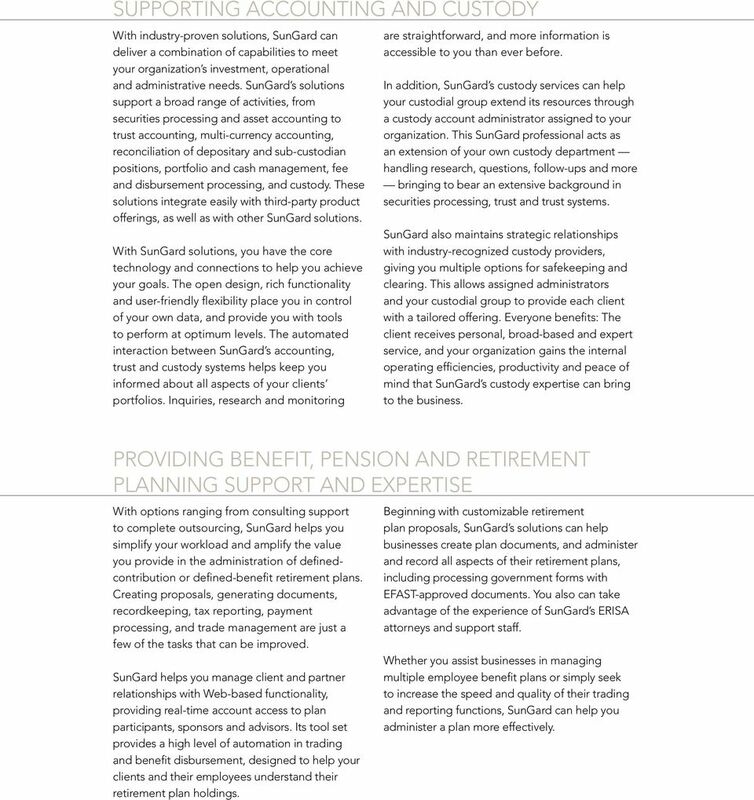 Providing Benefit, Pension and Retirement Planning Support and Expertise With options ranging from consulting support to complete outsourcing, SunGard helps you simplify your workload and amplify the value you provide in the administration of definedcontribution or defined-benefit retirement plans. Creating proposals, generating documents, recordkeeping, tax reporting, payment processing, and trade management are just a few of the tasks that can be improved. SunGard helps you manage client and partner relationships with Web-based functionality, providing real-time account access to plan participants, sponsors and advisors. Its tool set provides a high level of automation in trading and benefit disbursement, designed to help your clients and their employees understand their retirement plan holdings. Beginning with customizable retirement plan proposals, SunGard s solutions can help businesses create plan documents, and administer and record all aspects of their retirement plans, including processing government forms with EFAST-approved documents. You also can take advantage of the experience of SunGard s ERISA attorneys and support staff. Whether you assist businesses in managing multiple employee benefit plans or simply seek to increase the speed and quality of their trading and reporting functions, SunGard can help you administer a plan more effectively. 6 Speeding and Securing Workflows SunGard s workflow and business processing solution blends business process management (BPM), document management and content management into a cohesive platform. The solution captures, consolidates and archives all incoming data and documents, and then maintains this information in centralized databases. This approach promotes efficiency and helps ensure regulatory compliance. You can use SunGard s Web-based, businessprocessing tools to track the circulation of data through your organization and generate reports on your workflow. The insight you gather can help you lower costs, save on paper-based and manual processes, and improve efficiency and performance. In short, SunGard s solutions support you in optimizing and controlling all aspects of your business operations. SunGard s workflow and business processing solution is trusted and tested daily at top financial services institutions across the globe, as well as at large and small operations inside and outside of the financial services industry. Its modularity and adaptability allow you to build a fit-to-purpose solution addressing your unique workflow challenges. 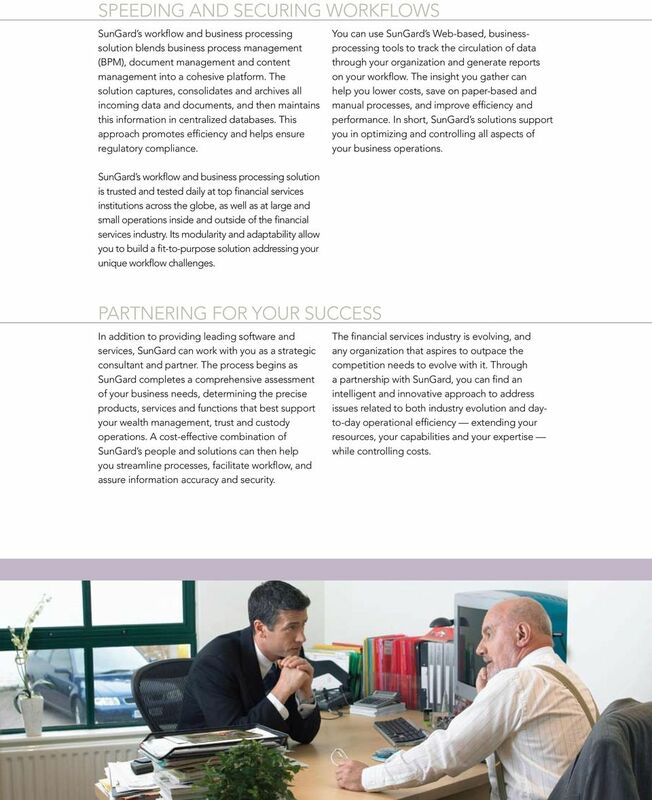 Partnering for Your Success In addition to providing leading software and services, SunGard can work with you as a strategic consultant and partner. The process begins as SunGard completes a comprehensive assessment of your business needs, determining the precise products, services and functions that best support your wealth management, trust and custody operations. A cost-effective combination of SunGard s people and solutions can then help you streamline processes, facilitate workflow, and assure information accuracy and security. The financial services industry is evolving, and any organization that aspires to outpace the competition needs to evolve with it. Through a partnership with SunGard, you can find an intelligent and innovative approach to address issues related to both industry evolution and dayto-day operational efficiency extending your resources, your capabilities and your expertise while controlling costs. 7 SunGard Tel: SunGard. Trademark information: SunGard and the SunGard logo are trademarks or registered trademarks of SunGard Data Systems Inc. or its subsidiaries in the U.S. and other countries. All other trade names are trademarks or registered trademarks of their respective holders. Brokerage products and services offered by SunGard Transaction Network (STN) are provided by SunGard Institutional Brokerage Inc., Member FINRA/SIPC. SURETY. OneShield.com Leadership. Service. Technology. That s our policy. iworks healthcare Macess business solution platform iworks HEALTHCARE Helping You Capitalize on Change Healthcare reform is prompting insurers to take aggressive steps today to prepare for tomorrow s uncertainty. Fidelity WealthCentral. Proven. Open. Integrated. Accurate, Intuitive and Innovative by Nature. Global by Design. Building financial security since 1958 Your Retirement Plan Strategy Expert Advice Innovative Options Personalized Service We deliver the superior service you deserve, backed by the expertise you expect. Is it time to upgrade to an easy-to-use, customer-centric policy system?